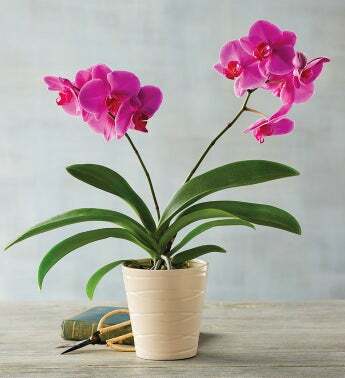 Bring beauty and elegance to any room with a gorgeous pink phalaenopsis orchid. Offering a brilliant display of color, this plant makes a wonderful year-round gift for yourself or someone special The delicate pink petals complement the geometric-shaped pot splendidly, making it a perfect addition any home décor. Protect against direct sunlight to ensure your orchid thrives. Note: container may vary slightly in shape and color.